I love rains, but do not quite like the effect it has on my skin. I call this a scrub , but we can very well say that this is a kind of body mask. 1.Pour the milk on the oats in a bowl. 2.Let it stand for sometime , so that the oats absorb the milk. (The Milk must be cold). 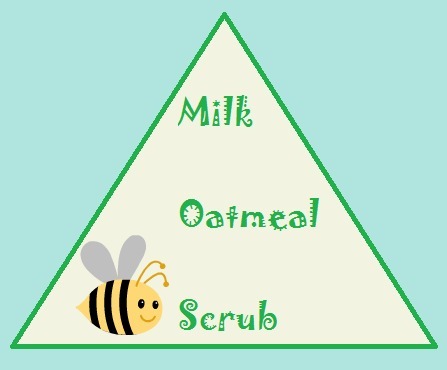 3.Put 4-5 drops of honey when the oats are swelled up and mix it nicely. 4.Apply on your body and the best thing is this can be used for your face. 5. Keep this for 2-3 minutes and then slowly scrub, using your hands. 6. Wash of using warm water. The next thing you are going to notice is naturally moisturized , supple skin. I loved the result, very good for this season !! And the best part is , you can use this for tan removal also. and all about recycling a little bit of leftover! !